Reading this book was an eye opening experience for me. It consists of a collection of essays, poems, letters, and reminiscences about raising black sons, all written by female black academics and artists. 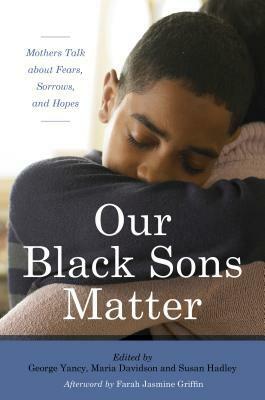 The title, "Our Black Sons Matter," alludes to the public deaths of black men and boys such as Trayvon Martin, Tamir Rice, etc as well as to the Black Lives Matter movement. Please note, this is a book about a politically charged topic by academics and artists. If you are hold a politically conservative point of view, expect to read things that are counter to your opinion.The theme of almost every article is the maternal worry of these authors about their sons. In most cases, these are normal parental worries: How can I navigate the public school system to get the best education for my son? Will my son have good teachers who can believe in his potential? Will my son choose good friends? When should I have "The Talk" with my son and how should I do it? Will my son be safe when he leaves the house to be be with friends? Will my son be safe when he drives?What was eye opening to me was how race modified each of these worries: Will my son's teachers punish him excessively for natural, boyish exuberance because he looks like others they consider to be mis-behavers? Will my son be more easily pushed onto the remedial track because he looks like the under-acheiving type? Does my son know to be especially polite to anybody who seems even remotely like a police-officer? Does he understand that his being seen in a predominantly white neighborhood at night could lead him to be questioned by police? When do I have "The Talk" and tell my son he will be more harshly punished by teachers and law enforcement than white kids will be, even if they happen to be doing the exact same thing? In short, this book helped me see a different point of view. It was enlightening. If I were in the authors' position, I would probably think and feel the exact same things. I recently moved to a neighborhood that is at least 80% black and 10% immigrant. And I see a lot of the things this book talks about: parents worrying about the safety of their children, worry about the education of their children, and police everywhere. My favorite entry in the book was an essay titled "Black and Blue" in homage to the famous Louis Armstrong song. It was by a woman who is both married to a police officer and a mother of young black sons. She struggles with the divide of keeping her husband safe in his nerve-wracking, risk-filled job, and ensuring that her sons live to adulthood.What this book lacks are good statistics. Each author takes it as undisputed fact that black men are pulled over more, arrested more, beat up more, and shot more often than white people who are doing the exact same thing. None of them attempted a good study of the available public and private data. The existence of the internet and freely accessible data doesn't necessarily lead to firm conculsions. A simple web search can lead to numerous studies by or reported by The Washington Post, The New York Times, and notable researchers such as Peter Moskos and Roland Fryer. Some conclude that black men are more likely to be shot by police and some conclude that they are not. Some use blatently awful statistical trickery such as can be found in my favorite book How to Lie with Statistics (I'm looking at you Bill O'Reilly). I've found the general consensus to be that black men are far more likely to be pulled, arrested more, and beat up than white men in similar conditions. Whether black me are more likely to be shot and killed in a manner that is not justifiable seems to still be debatable. Speaking of statistics, I think it is important to remember that these authors are not a representative sample of the 41 million black people in the US. Nor does this book represent to the mothers who have actually lost their sons to the police. I'd love to hear their story. This is such a well-written book. The way in which everything is explained makes you understand the feelings that African-American parents feel. This is a must read...I promise, you will not regret it! !